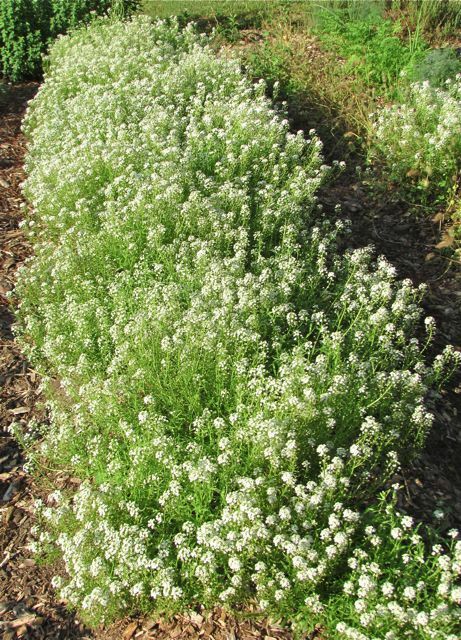 My blog software statistics (thanks, WordPress) tell me that I get a lot of visits from folks looking up Sweet Alyssum. Today, I thought I’d give you an update on the progress of this annual in my garden — gardens, actually. I sowed the seeds with the intention of interplanting the flowers with my veggies to entice pollinators and aphid eaters to the garden. But some of you may recall that I got a tad carried away when I sowed these tiny seeds in my greenhouse back in February. I ended up with approximately a gazillion plants. I told you why I wanted to plant them here. I described the initial germination results for these flowers here. Then I mentioned their early enthusiastic progress here. The picture doesn’t really do them justice. The bed is visually stunning. You can also smell the sweet, but not overpowering perfume of the flowers from quite a distance away. I was standing beside them a few hours ago while Wonder Spouse was harvesting some sweet onions and a few garlics, and the longer I stared at them, the more different kinds of insects I realized were visiting these flowers. I saw numerous species of solitary bees, several different beetles, fireflies, and even a few butterflies stopped by for a quick drink. No lacewings — which is funny, since those insects were what the Sweet Alyssums were supposed to attract. But the lacewings may have stopped by and then moved on due to lack of their favorite snack: aphids. So far this year, my garden has been astonishingly aphid-free (knock wood). I have no idea why. I also tucked in a few Sweet Alyssums along the front entry walk to our house. They looked great early on, but now the Lantanas-That-Will-Not-Die (a story for another time) are rapidly overshadowing them. The Sweet Alyssums valiantly persist, but they are undeniably getting squeezed. All in all, I’d say I’ve more than gotten my money’s worth from these beautiful, fragrant annuals. And the best part is they’re still going strong, despite a record early heat wave that had us sweltering with 100-degree-plus heat indexes before May was even over. I can see why so many Internet searchers want to know about this delicate, but surprisingly tough flower. It will most definitely remain on my must-plant list for future vegetable (and other) gardens. It is 38.5 degrees F outside as I type this — and it’s almost noon! In the North Carolina piedmont in late March, that’s unusual — not unheard of, but unusual. What is usual, alas, at least lately, is that our precipitation amounts fell far short of the amounts promised by the meteorologists. In fact, I’ve just about had it with the meteorologists. They stand confidently in front of their maps, showing off their myriad computer models, assuring viewers of weather events about to occur. And — at least for my yard — they are always wrong. I must live in some kind of weather netherworld, because my temperatures average ten degrees cooler, except on very windy days, and my precipitation amounts are a joke compared to the numbers reported for areas just 30 and 40 miles away. I am trying not to be paranoid, but it’s hard not to suspect a conspiracy — at least not on gloomy, cold days like today. To cheer myself up, I dug my winter coat out of the closet and visited my greenhouse. I was not disappointed by what I saw. The germination chamber in the back of the top photo is full of six- and 4-packs planted with tomato and basil seedlings. I tucked the freshly planted pots into the chamber on March 23, and today, all but one pack has visible seedlings popping up — not bad for a little over three days. The basils actually started sprouting after two days. I’m growing four kinds. Two are culinary basils, rich in aromatics — pesto magic. They are called Aroma 2 and Nufar. I’m also growing lemon and cinnamon basils this year. If you’ve never tried these, you should. The lemon basil adds a citrus-basil zing to salads and just about anything else you try it in. Cinnamon basils are gorgeous plants, and I find them wonderful in desserts. They dress up everything from vanilla ice cream with fruit to my favorite pound cake recipes. I’m getting hungry just thinking about them. As for the tomatoes, two varieties are already sprouted and out of the germination chamber. I sowed them earlier, because they require the most days to produce fruit. They are Purple Russian and Ferline. Here they are with Sweet Alyssum and Fernleaf Dill seedlings. You may want to click on the above photo and check out the plant in the pot at the top. It’s a Chinese Asarum that I got years ago at a plant auction. That purple-maroon blob beneath the leaves is its very cool-looking flower. The long strappy leaves in the pot are yellow Zephranthes volunteers. This little bulb seems to self-sow very enthusiastically in my greenhouse. As for the tomatoes just emerging in the germination chamber now, Viva Italia was first and most numerous. But Sweet Treats, and Early and Italian Goliath seedlings are also now well up. Late to the party is Big Beef, which is still showing no evidence of germination. But it’s only been a few days. I’m not worried. I described all these tomato varieties in an earlier post here if you want to read more about them. If you’re wondering about the crowd of seedlings beside the tomatoes, those are the Sweet Alyssum seedlings that I never managed to transplant into individual pots. I told you about them previously here. You can see that their enthusiasm has not waned. 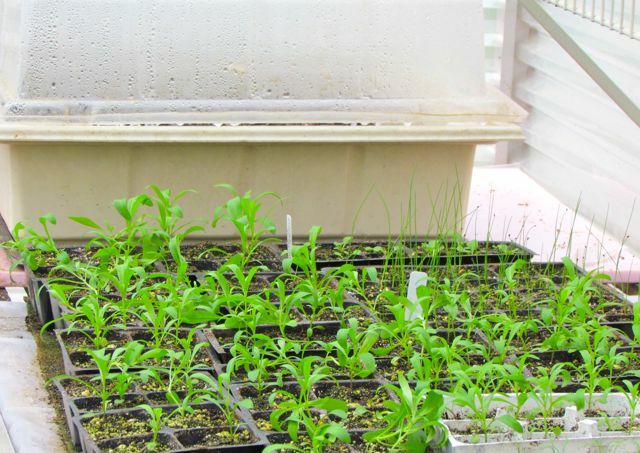 The first photo shows some of the Sweet Alyssums that I did manage to transplant. They are big enough to put into the garden, just as soon as I am sure we are past freezing temperatures for good. That will likely be another couple of weeks. In the meantime, I’ll be watering the seedlings every few days with a dilute mixture of fish emulsion and seaweed extract to help them remain vigorous. The spring veggies in the garden are also doing well. I’ll update you on those another day. Some of you may remember my earlier entry on Sweet Alyssum. Remember that photo of all the little happy seedlings in four rows of a square flat? Those seedlings are a lot bigger now. All of them have at least two additional leaves, some more. They’re about two inches tall, and hopelessly crowded. Yesterday and today, I started gently teasing tangled roots apart and transplanting individual seedlings into their own roomy 4-pack cells. Before I started, I watered them with a dilute solution of fish emulsion/seaweed extract in the hopes of reducing their transplant shock. I fed them this solution a week earlier too, which is probably why they grew so enthusiastically. My methodology for transplanting to the cell packs is straightforward. I start by filling the cells about a third of a way with potting mix. I then add a tiny sprinkling of all-purpose organic fertilizer, and stir it into the soil. As I gently hold a tender seedling with two fingers, I pour potting mix around it with the other hand, firming the soil as I go. After all four cells contain transplants, I water the pack thoroughly. This is a slow process. Water must be added very gently, or the dry potting mix sloshes out of the cells and the transplants get knocked over and buried. Slowly, slowly I add water, wait until it disappears, add more, wait, prop up any flopping seedlings, add a little more water, until water is coming out of the bottom and the soil in the cells seems thoroughly wet. I did this for an hour yesterday and another hour today. As I type, 85 — yes, that’s eighty-five — transplanted seedlings are adjusting to their new locales. That’s the good news — if we agree that it’s good that these poor little crowded seedlings now have a chance to grow properly. The bad news? Actually that’s two-fold. I’m going to have EIGHTY-FIVE Sweet Alyssums to plant among the vegetables (and anywhere else I can find open spots). The second bit of bad news: I only transplanted one and one-third of the four rows in the original flat. I estimate that approximately — ahem — 250-300 more overcrowded seedlings are impatiently waiting their transplanting turn. What was I thinking? In my defense, I don’t think I’ve ever grown this flower from seed before. I usually buy a few packs at the local garden store. But they weren’t there yet when I asked for them a few weeks ago, and the salesperson couldn’t tell me when they might arrive. So I bought a package of seeds instead, and, well, I went a little nuts with the sowing. It’s especially easy for me to get carried away like this in late winter/early spring. 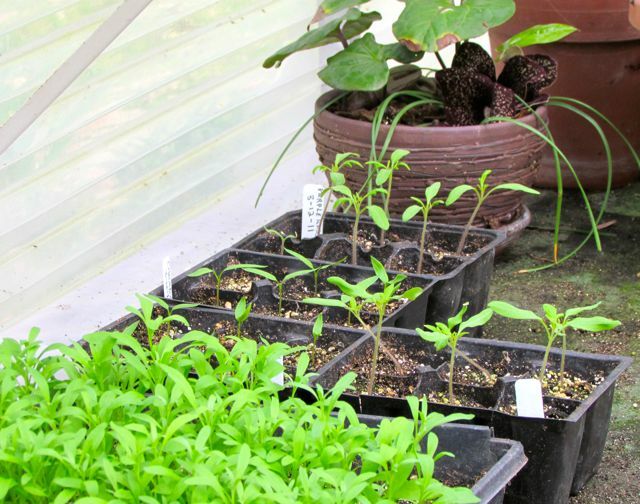 The allure of a humid greenhouse, rich soil, and green baby plants is irresistible, I confess. You may wonder what I plan to do with those hundreds of crowded and untransplanted seedlings. For now, while I still have room in the greenhouse, I’m going to leave them as they are. If they are still alive after my already-transplanted seedlings have all found homes, and if I think I might still have a few free spots for more alyssums, I’ll try to gently separate more of them and directly plunk them into the ground. If they live — fabulous! If they don’t, their little plant bodies will contribute to the organic material in the soil. Any remaining untransplanted seedlings will become compost — a bit of an ignoble end for innocent victims of my excess enthusiasm. But, in one form or another, they will all eventually make it into my garden. It’s not a whammy of a comeback. No frozen precipitation. We did get a five-minute sprinkle of rain this morning. Not enough to do the earth any good, but enough, at least, to moisten the air a bit. Heavy clouds and a steady north wind are keeping the temperatures in the low 40s F — chilly, but not frigid. Still, after yesterday’s upper 70s, the change back to late winter weather is a shock to the system. Birds and flowers continue to act as if spring has arrived. 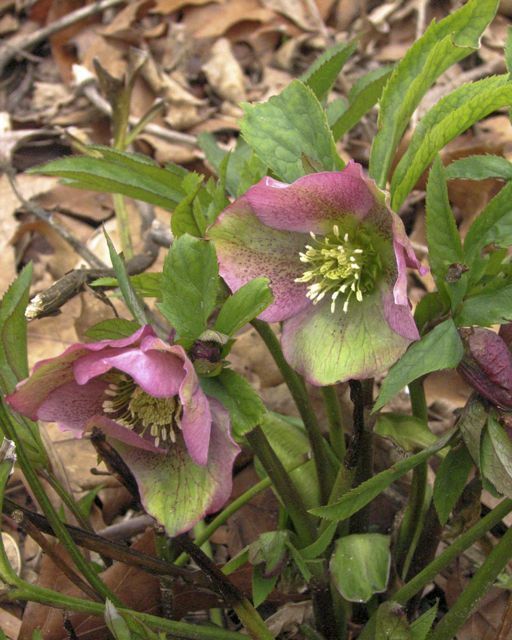 The Lenten Roses are open, the bluebirds are burbling their courting songs as couples flit from one birdhouse to another, discussing the merits of each potential abode. The woodpeckers followed me around the yard complaining until I refilled their suet feeders. They are actively nesting, so they want to minimize the energy they spend on food-gathering. A quick visit to the greenhouse revealed that the Sweet Alyssum seeds I sowed last Sunday afternoon are enthusiastically germinating! Seedlings crowd the rows I sowed (too heavily — those seeds are tiny). I’ve lifted the top off the germination chamber to reduce humidity, but I’ll leave them on the germination mat one more night to ensure that most of the seeds sprout. Tomorrow, I’ll take them off the mat, which will make room for more pots of newly sowed seeds. I’m moving into garden production mode now. In between sowing seeds and tending seedlings in the greenhouse, I’ll be tending the spring garden, and trying to weed and mulch the front flower beds. Those front beds are a mess, but I’m just one person. For now, food plant production will remain my priority. The rest I’ll get to as weather and aging joints permit.